An avid composer and supporter of contemporary music, Patrick Neher's works have been premiered in New York and Los Angeles as well as in his home state of Arizona. 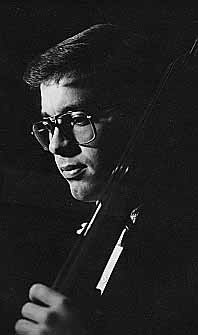 He gave his debut recital on the bass at age 12, and by 15 he was performing with the Orchestra of Santa Fe as the youngest professional bassist in New Mexico. He presently serves as principal bass with the Tucson Symphony Orchestra. As a recitalist he premieres "as many new works for the double bass as humanly possible." About the Serenade he says: "It was written in August 1979 for Carolyn Davis while I was attending a music festival in Mexico City. It was premiered by Ms. Davis in New York City, April 1980. The piece is written to be performed as dynamically and emotively free as possible, much like an improvisation."